Understandably, violin makers like to be credited. The usual strategy is to put in a label under the left f-hole, and this violin has that. Just to be safe, Mr. Carletti also signed the top. Then, to be sure, he put another label on the upper block, visible only through the end pin hole. He didn’t put brands all over the inside of his violin, but that’s commonly done by some makers. Genuzio Carletti, in Italy, had a working relationship with Joseph Settin in New York. 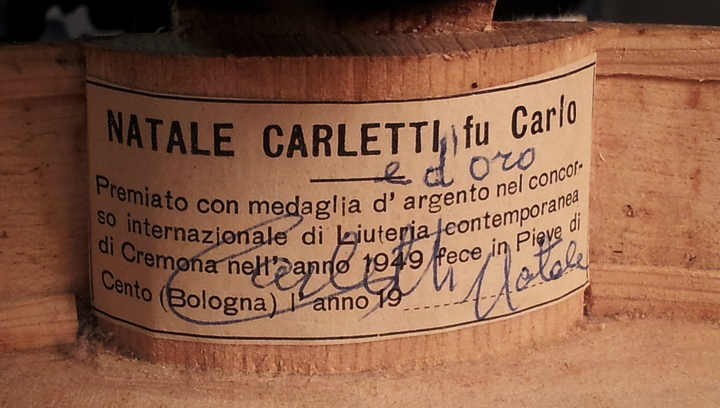 Carletti made instruments, and Settin set them up and sold them. 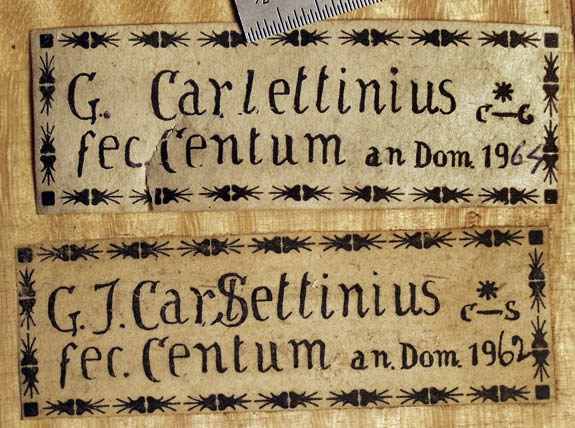 The two labels above were found glued one on top of the other (the earlier dated one hidden under the newer). It appears that Settin wanted some way to indicate the collaboration, and wasn’t sure how obvious to make it, but ultimately settled for the less-transparent solution. A friend of mine remembers visiting the Settin shop in the 60s. He said that it was a messy place with incomplete bits of old violins were strewn around, and it appeared that perhaps new whole instruments were being made to include them, John Lott style. Notice how the label isn’t glued in all that well, though. It’s in the wrong place, near the center of the back, looks hastily slapped on, and is a bit loose around the edges. What do we see when we take a look underneath? A signature of the real maker! Somewhere along the line, someone thought they’d upgrade the violin, but contrary to their intention they downgraded it by turning it from a signed original into an obvious fake. 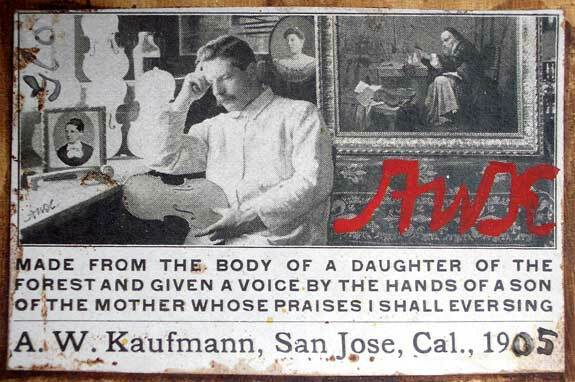 The real maker is obscure, but he’s a known maker, and now the violin is real again, with the real maker’s name attached. That’s a solid upgrade. Some labels are better than others!